This one’s for all those people who have begged me to make them some jam from their glut of plums. The answer’s a firm ‘No’; not because I don’t love you, but because it’s just too easy to do it yourselves, and it only takes an hour to make. This batch of jam was made from a bucket full of windfalls from a friend’s farm, hence it’s a Waste Not Want Not recipe. 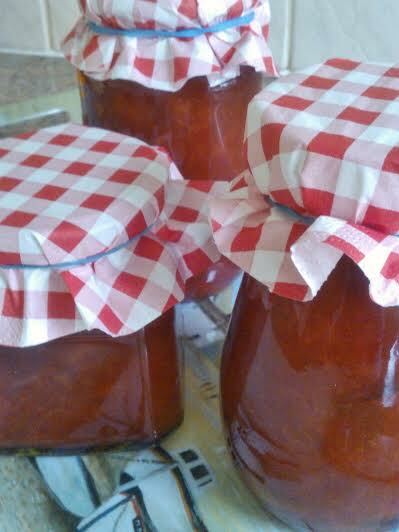 Jars: Collect old jam jars and lids; wash them well- preferably dishwash them, which is as good as sterilising. Put a clean tea towel on an oven tray, and place the jars & lids upside down in a warm oven (about 80 c) for twenty minutes or so (hot jam and cold jars are an explosion waiting to happen). Jam: Basically you either use a fruit to jam ratio of 1:1, or if you prefer your jam slightly less sweet, use half to three quarters of the sugar. If you’re using berries, which have less pectin (helps the setting), use jam with added pectin or pop a sachet of pectin into the pot. Wash plums and remove stalks. Cut the plums in half (vertically), then twist to open and remove the stone. Place fruit, lemon juice and water in a large, deep, heavy based pan and bring to the boil, stirring frequently. Stir in the butter to help reduce frothing. Turn up the heat and stir continuously until the mixture comes to a rapid boil. Continue stirring on high heat until the jam reaches setting point (104c). To test – place a teaspoon of jam onto a cold saucer. Allow to cool, then push your finger through the jam, it should start to congeal and wrinkle up – if you can push your finger through and its still runny, you haven’t yet reached setting point. If still not set, return the pot to the heat; bring back up to a rolling boil and test again in a few minutes. Remove from heat and pour gently into clean, sterilised, warm jars. Seal and label while jars are warm. Et voila, nothing to it. So go get picking, what are you waiting for? I SO want to make jam !